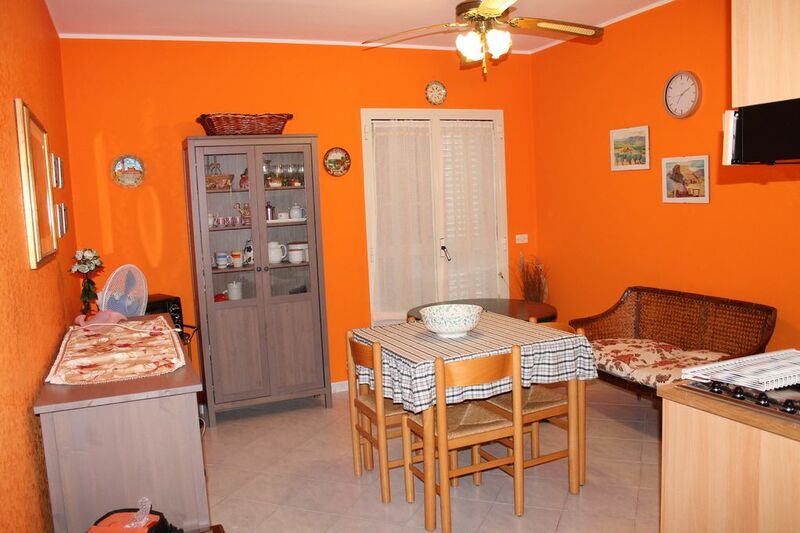 Ground floor apartment with terrace, 2 bedrooms, living room kitchen. Lovely apartment located in a luxury residence in the town center. The house offers all the comforts for a relaxing holiday. The house is very quiet and is located in a residence with a private road. It consists of 2 bedrooms (1 bedroom, 1 bedroom with 3 beds), a living room where there is a sofa bed for two people, a total of 7 beds. more laundry bathroom with private washing machine, ironing board more 'iron, hair dryer x Hair. It offers parking inside the residence. Upon request, a bike x move with more ease and reach the beach. Excellent geographical position, near ETNA, GORGES ALCANTARA, 40 'from ETNALAND, 30' from CATANIA, MESSINA, 2 km from the beach S. Marco, attacked the touristic resort of Recanati / Giardini Naxos and 10 minutes from Taormina, CASTEL MOLA. THE APARTMENT DOES NOT HAVE THE WI FI. No internet connection present. Comfortable apartment but lacking some basics. No wine glasses or bread knife, only half of a toilet roll and an oven which had to be out onto the floor to be plugged in. It was clean and the bed was comfortable but with a little effort it could be much better. Nice facility in a good location for access to nearby sites. The shower was the weak point of the place. We enjoyed our stay. nous avons trouvé l'appartement pas assez propre, nous avons du relavé toute la vaisselle avant de l'utiliser. La douche est à changer en urgence, réglage difficile pour des enfants et fuit de partout. Casa messa in un punto strategico per visitare i punti di interesse. Arredamento nuovo e casa molto fresca. La proprietaria è molto gentile. Facilità di parcheggio. Wir haben uns rundherum wohlgefühlt. Vielen Dank für die schöne Zeit. In the month of August we are held many typical tourist attractions of the place, such as Palio, MEDIEVAL EVENINGS, FESTIVALS, ETC ..